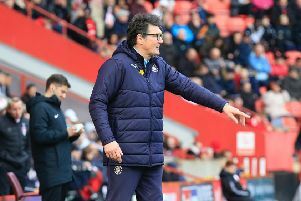 Luton Town recorded back-to-back league wins for the first time this season in astonishing fashion after a 2-1 victory at Wycombe Wanderers on Saturday. Here’s how the Hatters players rated on the afternoon too. Marek Stech: 8 - Some crucial stops kept the Hatters in the game, especially just moments before Cuthbert’s leveller. Came out to claim long balls whenever possible too and alleviate the pressure on his defence. Impressive again. Jack Stacey: 7 - Had some rare moments where he could get forward on the right, but not in the same manner as during midweek, with Town often pegged back. Dan Potts: 7 - Did well in the air once more when defending his box and had shouts for a penalty when it looked like he was clearly pulled back in the area. Glen Rea: 6.5 - Had appeared to be just about getting to grips with the obvious aerial threat from the Chairboys until 40 minutes when left isolated against Akinfenwa and the big man did the rest. Moved into central midfield when McCormack was off and got stuck in. Alan Sheehan: 7 - Defender had his hands full all afternoon in trying to keep Wycombe’s attacks out from Town’s penalty box. Limited the hosts to few clear cut chances and true passion on display when Luton won it. Alan McCormack: 6 - Couldn’t repeat his stunning displays from the last two games as Wanderers often bypassed him to hit Akinfenwa. Replaced before the break holding his groin too. Pelly-Ruddock Mpanzu: 6.5 - Few decent bursts, but all too often Wycombe got round him to shut down any promising advances. Cracking volley required tipping over and his athleticism paid dividends late on. Luke Berry: 6.5 - Got through plenty of work in tracking back and a superb sliding intervention prevented Wycombe moving 2-0 ahead just before the half time whistle. Andrew Shinnie: 6 - Couldn’t ever really get going as Town didn’t have the ball in advanced areas that often. Frustration saw him see yellow and made way for Cornick on the hour mark. James Collins: 7 - Unlucky to see his goal ruled out for offside in the first half, but proved just what an important signing he is by getting on the end of Cornick’s cross to loop home a dramatic winner. Danny Hylton: 6.5 - Almost too casual with his penalty as Brown kept it out fairly easily in the end. Did well to not react during the 90 minutes and lovely cross from the left for Town’s equaliser. Scott Cuthbert (SUB, STAR MAN): 8 - Ventured upfront to great effect in the final stages as produced a finish worthy of any striker to draw Town level. Helped Luton look more stable at the back too. Harry Cornick (SUB): 8 - Made a massive difference when he came on as had a huge hand in the first goal with his direct running and even more so for the second, producing an excellent deep cross. Close to starting soon. Elliot Lee (SUB): 7 - Another game-changer who had an impact as he busied himself upfront and made crucial flick on for his skipper’s leveller.